Two Salons To Pamper You! Located conveniently within the Temecula Valley, Great Nails' two easy-to-find salons provide easy access to the I-15 freeway, allowing for a quick and easy trip to your favorite nail salon! 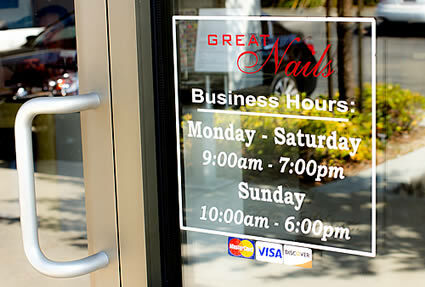 Whether you are closer to downtown Temecula or further south along Temecula Parkway, Great Nails has a location near you. We welcome you to visit our newest location, in the historical Tower Plaza near the intersection of Rancho California and Ynez Roads, or at our original shop in Temecula Creek Plaza. Visit either of our salons soon, and treat yourself to the attention you deserve!